The Hobie Island Club T-shirt and decals arrived by mail yesterday. A nice touch. Thanks Hobie. We received ours also. Lorraine Garnier does a great job coordinating the Island Club. How many companies, especially in this economy, do you see doing this kind of promotions? I agree, nice touch! I have a potentially stupid question. I've tried signing up for the island club but haven't heard anything back because I think I have the wrong serial number. Where is the serial number located on the TI? I bought it from a previous owner and none of the paperwork had the serial number on it. The serial number is at the rear on the starboard side. it isn't all that easy to see, so you might need a light to help distinguish the characters. Found it! Thanks for your help! I found it, too. Thanks for asking the question. Would have never, otherwise. 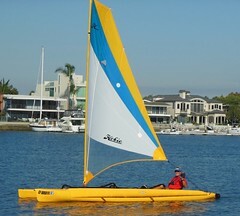 A big thank you to the hobie Oceanside and to Mr. Garnier for the advertising material hobie island club. A nice touch ....... An unexpected Christmas present. The value doesn't matter ..... but counts the thought and effort to have him sent over the Atlantic Ocean. and now? ..... .... hobie island club Rome/Italy.